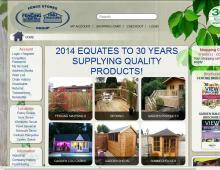 Garden Fencing – Fencing panels, timber fencing, trellis, posts and fencing materials. Garden Decking – Decking products include decking boards, handrails, spindles, joists and fixings. Wooden Gates – A range of styles can all be made to exact sizes for the customer. Garden Sheds – Sheds include workshops, potting sheds, playhouses and tool stores. Garden Log Cabins – A range of sizes and styles for the garden which can be used to create a home office, children’s playroom or for additional outside living space. Summerhouses – Made from timber the ranges include octagonal and corner summerhouses for the garden. Outdoor Seating – Garden benches and picnic tables. Garden products – Arbours, archways, screening, pergolas and bird tables. The Fencing Centre covers the areas of Bournemouth, Christchurch, Ferndown, Wimborne, Dorset, Yeovil, Somerset, Sidmouth, Devon, Totton, Southampton, Hampshire and Oxford.